Share "Housebreaking Tips for Adult Dogs"
When most of us hear about housebreaking for dogs, we imagine tiny fresh-faced, little puppies. But what about when the dog you are trying to train is an adult rescue-job, who has no other identifiable issues that could be responsible for their soiling behavior? In that case, the rules for training your pooch are a little different. Read on as we give you our top housebreaking tips for adult dogs. And visit visit PupsBest.com to find out more about pet gates that you can use to help your dog adjust to your new home. To prevent your dog from having unexpected accidents, make sure to feed him or her at the same times each and every day – and also be sure to take his bowl away in between meals. Make your dog's meals predictable – and his bowel motions will follow suit. The best way to toilet train your dog is to get him into a toileting routine that through enough practice will become second nature to him. Create a toileting schedule for your hound (at least four excursions to the toilet each day. This applies to fully trained, adult dogs just as much as to the one that's being housebroken), and to really make it sink in, be sure to always go to the same areas to void. If your pet can smell her own scent, this will make it easier for her to go. Housebreaking your dog is exactly the same as training him to do anything. 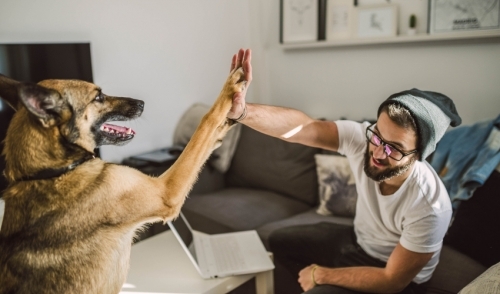 Cultivate desirable habits in your canine friend by rewarding good behavior with affection and praise, treats or games/play – and punish bad behavior by withholding these things from him or her. Your dog will quickly get the message. If you catch your pet in the act of going to the toilet at an inappropriate time and place, clap your hands together loudly in order to startle them out of the dastardly act they are about to perform. Then take her outside and give her treats and affection after she has finished eliminating in the proper manner. Remember, startle your dog, don't scare them to the point where they are incapable of receiving your instruction. Yelling at your dog, or punishing them in a severe manner, will only make your pooch scared of you, so that they run and hide from you when the time comes to go to the toilet – counterproductive, to say the least. And make sure to startle your pet ONLY when they are actually doing it inside the house. They won't make the proper connection if you don't correct them while the misbehaving is going on. Whilst some dogs give very obvious signals when they want to go to the toilet (for example: scratching at the door), others will not. To prevent unwanted mishaps, and properly housebreak your dog, you have to learn how to read your pet's behavior, and what signs he tends to give off when he's gotta go – and for this careful and ongoing observation is necessary. You need to be able to read your pet like a book, basically. No matter how diligent you are in housebreaking your dog, you are still going to encounter accidents – at least in the early stages. And dogs to tend to keep going in the areas they have gone previously, so you will probably have to engage in some really good scrubbing and deep cleaning to prevent certain areas from becoming permanently stained and smelly. We love and recommend Skout’s Honor Stain & Odor Remover, or their Urine Destroyer!